I surprised the tracks aren't parallel to the ships at the docks. Wouldn't that make it easier to transfer containers between the ships and railcars? Much of this is all information passed to me from other parties, so I cannot attest to its acuracy. It is because, despite the name of the project implying direct ship to rail transfer of containers, there will actually be a short amount of drayage from the cranes that unload the ships ti the cranes that load the railcars. From what I picked up working in an intermodal yard for a year or so, it is easier to add an extra step of handling to the container than it is to attempt to load railcars directly from the massive cranes that unload the ships. Apparently railcar and container damage is more common when attempting a direct ship to rail transfer. The guy who operated the crane who told me this said it was due to the design of the well-cars used commonly for double stack trains. Also, I would imagine the tracks are laid out like that for the sake of capacity. A diagonal set of tracks is longer than a straight set would be. I truly wish they had laid about 20 parallel tracks the legnth of the old Military Ocean Terminal and used those to build trains as well. That is such excellent real estate for shipping operations. It seems a waste to use it as a (very ugly) place to dock cruise ships. SemperFidelis wrote: Much of this is all information passed to me from other parties, so I cannot attest to its acuracy. Also, the operator of the ship-to-shore crane is placed high up and I think still depends on hand signals from the ground in positioning the container, whereas the operator of the wheeled device (piggypacker, or side loader) that moves the container from the ground to the car is right there at ground level, which must be a help in guiding the container into the well. Also correct that the longer the tracks the less switching is required to place the empties and assemble the loads into a train. There is a great saving in time if the terminal manager doesn't have to call the yard to do a reset in the middle of an operation. Same type of loading/unloading operation as in Camden (Broadway Terminal) where steel slabs are unloaded from the ship and placed on a flatbed trailer, then driven a few thousand feet to a location across the street from the docks and loaded into rail gondolas staged on a spur track similar to what's being constructed here. The final loading into the railcar is handled by a movable gantry crane that bridges the track. Remember that ship unloading equipment is very, very expensive, and the cost of diesel fuel and truck/trailer operation is almost negligible in comparison. Does anyone know if Port Jersey Rail or New York New Jersey Rail will switch the yard? With a lot of manufacturing moving out of the area, a lot of the ports focus will be on getting traffic for other parts of the country. That's really what this is about as the big ships bring big potential for the eastern third of the US. The port of NY/NJ is still the least amount of rail drayage to most cities in the Midwest than any other east coast port. Hopefully by the end of 2017, there are a lot more containers being routed to the east. The industry that's left is here to stay. Some stuff can't flee. And anyway, warehousing is much more important for the port, and that has been really growing. I think this is more of a relevance play. All the uppity East coast ports like Savannah, Charleston, Miami/Everglades and Norfolk sell themselves as gateways to the Southeast/Midwest, usually with rail as the land mode partner. NYNJ has always been and always will be important because of, well, NYNJ. Ships will always come to the port to unload their NYC area cargo, and that's a massive amount of traffic, but the inland stuff is in play. Currently, ~80% of port traffic is NYC bound, but there is massive potential for growth of that 20%. If the PA can improve their inland connections, they could become the only stop ships make on the east coast, using their inherent market advantage of NYC and said connections to make stopping elsewhere on the coast a waste of time. Anyone know who is the rail operator st this facility? Dcell wrote: Anyone know who is the rail operator st this facility? 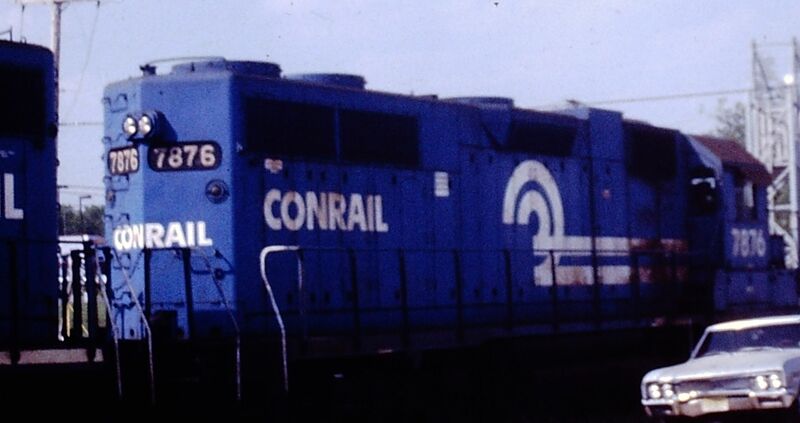 Conrail, on behalf of its two owners.